In the greenhouse, the salad has sprouted: in a month or so it should be ready to transplant outside. No sign of mushrooms, though. Outside, I have been digging here and there - I am currently clearing the wild flower meadow around the pond - in preparation for planting. The weather has been really pleasant, with a very pale sun but mild temperature. And at this time of the year there is often a curious robin around, keeping an anxious eye on what is happening and in search of an easy catch of surfaced earthworms. Today I transferred all my potatoes and onions - which I had previously stored in cardboard boxes - to the appropriate sacks (hessian and plastic net respectively). 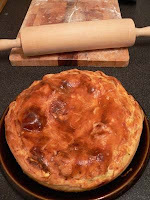 I must say they had kept reasonably well, although a couple of potatoes have chitted and a few onions have rotted: I have learned that I should not leave the hard neck in the onion, it seemed to be the source of the rotting. I seem to have tons of tiny potatoes from last year to plant next year: where will I find room for them? Crop updates, planting soft fruis. Yesterday was a great morning at the allotment! I had been there last week but the weather was not too good, so I barely enjoyed planting the raspberries in thick heavy mud that made work ten times as hard as it should, with florid weeds coming out at every spadeful. As you will have noticed, I did not even feel like writing about it. If I have to look at the bright side, though, I must say that I found very rewarding to dig out all the abandoned berry plants on the left boundary path. Soft fruits are quite invasive, and these plants (which I should not complain too much about as they fed me through the summer) were definitely overgrowing, but my neighbours were not bothered as they do not use the path so I offered to do it myself. I divided up the uprooted plants between my neighbour and me, and I have to find a less obnoxious place for them to thrive next year. Yesterday morning the weather was just fine and warm: it has been so mild of late that there were buttercups flowering (not that that makes me particularly happy, as creeping buttercups are one of the worst weeds in the allotment, so I welcomed their efforts by weeding out a wheelbarrow-full)! A dozen of new strawberries (Florence, the ones the last year produced more) had arrived during the week, so I planted them and managed to find room for a couple of the raspberries I digged out last week. One of the gooseberries cuttings I planted a couple of weeks ago has pushed out a tiny leaf, and salad is also sprouting in the greenhouse, although there is no sign whatsoever of mushroom. Phacelia is doing terribly well, next year I will plant more to keep the soil from being washed of nutrients over the winter. Parsley is doing well also, although in a less vigorous way. Rhubarb's fat buds are emerging, a rich pink in colour: I must remember to feed with manure later on. The blueberry I planted earlier this autumn has a lots of buds, despite the soil not being acidic at all in the allotment: this is something to be monitored. Potatoes for the new year have arrived during the week as well: they are now stored in my shed, where they should chit (although for some reason they seem to chit better in my kitchen larder). Sunny day: hooray! Chilly morning, still a very pleasant couple of hours I spent at the allotment. Duly planted the mushrooms beneath the glasshouse bench, working the granules in the manure and covering with damp newspaper. In ten day or so the spawn should start to form. The broad beans have also found their way into their winter bed and I have tidied up the asparagus patch, whose containing wall had bent to 45 degrees with weight (much less difficult than expected!). Weeds were cleared out of my "fancy" patch in front of the greenhouse door, where I planted lavender and bulbs around an existing gooseberry bush. While clearing, I was pleasantly surprised to find 3 oregano plants, which I cannot quite explain (Is oregano a UK wild plant? I doubt it... Did my predecessor scatter any seeds? Maybe... Did my plants - which are in a totally different place - spread seeds that far? Mhhhh) . Anyway, I transplanted one in the greenhouse and mulched around the other two: let's see if they live through the winter! Found some onion sets left from last year: most had wilted but some seem fine, so I will have a go at them next week. I also bought more raspberries and strawberries (last years' 15 plants, the runners I have transplanted and the new plants should ensure enough supply for next year!). 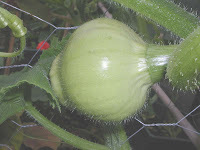 Tonight I need to cook pumpkin, as the three I got from the allotment are starting to go off around the slugs' holes. I have found two recipes. Bake at 210C for 1/4 hour then turn down to 175C for another 3/4 to 1 hour until an inserted knife comes out cleanly. This pie should take me through the week at lunchtime. The other recipe, my auntie from Italy dictated on the phone (not sure where she found it, possibly the Silver Spoon). Steam or boil the pumpkin and potatoes and then mix with the rest. Cook for 20 minutes until golden (does not specify temperature, auntie's guess is 175C). Not so long ago Thompson & Morgan updated their website, and although this is a purely commercial site and not specifically dealing with organic, they have included a little interesting content - on the other hand they have ended up messing up the online order form considerably, and you never seem to know exactly what you will pay. Anyway, I find useful the "What to plant this month" page, which gives me ideas for last-minute planting (being a compulsive buyer of greenery). Also, I find that you often get extra information on the plant from the website cards that is not on the seed packet, and keep telling myself that I should go back and read it before planting - but that is too time consuming so I never do. Having the information grouped by month has slightly increased my chance to read it , i.e. when I receive the newsletter - beware: they do send quite a lot of paper and email, which is quite annoying, but obviously it does them good because they keep sending more. 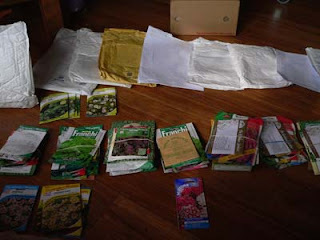 The Seeds of Italy newsletter, which I received as well, has also a little bit of suggestions on what to plant in the coming month (and they are more sparing with information): I did not realise you could plant some peas at this time of the year, so much to learn for me yet! Back to the T&M newsletter, I followed it through tonight and had a lazy look around so I noticed a "Gardening Hints and Tips" section. Some areas were fairly easy to read - such as the 'Germination guide' and the 'Growing potatoes' page - I will print it out for taking to the allotment. There are also pages on geraniums but I did not find any information on overwintering them, which I am quite keen to do as last year I managed to grow only 1 of 5 seeds of my Summer Shower Mix and the plant was really beautiful (unlike most of the varieties that are sold as plants). I still hope to save my lonely plant, despite the fact that it got frostbite when it snowed last month. More allotment-wise, I have almost done preparing my beds map to plan next year's planting. I will post it when it is ready. Unlike my student and business life, I seem to do better when I am not pressured for time on the allotment. Yesterday I had a great time preparing the mushroom bed in the greenhouse (apparently mushrooms do best on horse manure under the greenhouse bench, so I have prepared them a nice pile of it), planting garlic and covering up the herbs. I did not feel as I was firefighting and I have done quite a lot, clearing up a nettle patch that I will need to use up and throwing away rubbish that had been there for one year. Herbs were trimmed and covered with fleece so they are ready for any frost that may be coming. Planted garlic even though the soil was not at its best, while broadbeans are still waiting - hoped to do it today, I actually digged in the green manure in the bed in preparation, but it is b****y raining again! It is very hard this year with such weather: is it just me or was last year actually much better? Did you know that mint's roots smell of mint? :) They have outsmarted my containing plastic sheets and have anchored fast in the ground. I managed to take some out to plant in the greenhouse just in case the plant outside does not make it, and had enough to share some with the neighbours. I ended up making another Torta Pasqualina with 650gr of beet that was still growing! And, following up from last week: I had the borlotti beans cooked in tomato sauce and served with polenta: I was not overexcited about them but my husband did seem appreciative. I am curious to see what will come of the mushrooms when I finally manage to plant them - I have stocked up on newspapers, as you need to cover the spawn with wet ones. If it does not rain too much I may pop in later today and have a go at it. 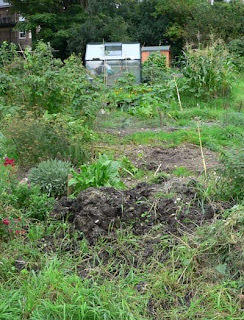 Allotments abroad, clearing up, crop updates, encouraging wildlife. This week I have been travelling to Switzerland and I must say my allotment holder soul was struck by a view from the train just outside Zuerich. Not considering the numerous chicken pens which made me think of the mountain village I used to spend my holidays and - more recently - weekends in in Italy (which I am sort of missing), I was surprised to see an allotment site over which, flapping in the wind, were flags from several countries. What a curious idea - I was thinking - when the train went past another one exactly the same. Obviously it is a tradition, and it felt good to see different nationalities so openly celebrated together in the close community of the allotments. Anyway, back to England, this weekend I finally managed a visit to my allotment after more than two weeks. To start with, everything looked horrible and I felt so disheartened. The snow had damaged the Borlotti beans and the sweetcorn, and most plants were either dead or dying, with the exception of the green manure Phacelia which is doing pretty well. It is really annoying to find out that the only thing than one would hope to be exterminated by snow - slugs - have instead survived pretty well, indeed so well that it would not be inappropriate to think of the plot as Slug Central. Although the weather was not particularly exciting, it did not rain, and I managed to clear everything up and dig the half bed that I will need to plant the garlic as soon as the ground is not waterlogged, hopefully next weekend. I guess I cannot complain. I have picked four pumpkins in the end, three of which should be ripe according to the rule that a pumpkin is ripe if it resists puncturing by fingernail. Also, I got 15 corn cobs, which are eatable albeit a bit starchy from staying so long on the plant. And 300gr of Borlotti beans - very little considering how many pods were on the plants before the freeze, but it is better than nothing, isn't it? I will try them tomorrow. Despite the overnight rain I managed to go again this afternoon, when it felt much better compared with yesterday, probably because it looked cleaner. As it started drizzling, I decided to clear up the greenhouse so that I can plant something inside: salad and mushrooms for example. It was a proficuous time: I managed to make everything neat and tidy, which was needed as there were signs of mice. Finding some chitted potatoes in a paper bag, which I must have brought over some time ago, I planted them inside, just to see what happens. 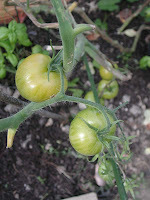 It is not the wisest of ideas, as I had to plant them in compost that had previously hosted my blighted tomatoes, but I decided to give it a try anyway. I also planted some tulip bulbs and erected a trellis to protect and train my fig tree on. In terms of socialising, it was good to meet the angel neighbour who felled the obnoxious tree at the top of the plot. While we were on the topic, and since he did not need his logs and wanted to burn them, I asked if I could have some myself. I will use them to start building my little "nature reserve" housing block. I have seen a great picture of one in "The Organic Way", the magazine that comes with the Garden Organic subscription. It consists of 6 pallets in a pile, filled in between with logs, hollow pipes, bricks, straw and rolled cloth: I want one! I have not been away from the allotment so long since I got it last year, but yesterday I felt pretty awful and today I have had to catch up on housework. Really counting on next weekend: garlic and broadbeans are waiting to be planted before the ground is too hard. I have found a leaflet on crop rotation and - between that and the instructions on my (very useful) book - I figured out that both my garlic and the broadbeans are going to go where the tomatoes were this year. ... so when it snowed copiously on Tuesday I was worried for the herbs - which I have not covered yet - and of all the other crops, in particular my Borlotti beans. It seems on our side of London it had not snowed in October since 1974. ... all the time I spend at the allotment, I would be Anthea Turner's Perfect Housewife, and my husband would shower me with gratitude. Quick visit to the allotment, community feeling. It was such a good day today that I could not resist going out of the office dot on the hour and pop in to the allotment, where I met my new neighbour: Keith, who is a newbie but will have his green-fingered wife's contribution. Actually, I discovered that I have two new neighbours: Keith in the bottom half and another guy (the angel out of my dreams who felled the tree) at the top. And I realised that my nickname of "whirlwind" has stuck, and fellow holders are still talking about me in those terms. I must say it is flattering, I pride myself in being "a doer", although I would not know about actually being a "whirlwind". The nickname originated when in a matter of a month or so I built both the greenhouse and the shed. Well, I needed them, I hoped to set everything up before the planting season (but I ended up running late anyway). It is nice that people bother to stick nicknames onto you, it creates a community feeling. I bet it's Nikki and Tom that spread the word, they are so nice and friendly and have spent a lot of time chatting with me, advising, helping me identify plants, sharing cuttings etc. They themselves are nicknamed something like "the farmers" as they are very organised, very meticolous and have a very professionally-looking greenhouse. Other characters are Geoff (who has three plots, considerable experience and I dare say a very respectable age besides a generous attitude) and the lawyer (I do not know his name, but he is there most evenings and has even gone some lenghts to greet me in Italian!). A lot of us are newbies, and it seems that there are more and more people in their late thirties to early forties. Sometimes there are kids playing on the path, or helping out and some dogs as well (very controversial topic, that of the dogs, as it can be argued that they are not overly hygienic besides devastating seed beds and seedlings, albeit occasionally and unwittingly). I popped into the allotment to take home some garlic and noticed that my new neighbour has felled an elder tree that was at the bottom of his/her plot and that was making an awful lot of shade in a place that is already shady and wet: I am so pleased, it is one of those small things that make a difference! I had been thinking of asking the allotment manager if she could get the tree pruned shorter, but it is much easier now that the problem has solved of its own accord, and better than expected. Although with a tiny pang of guilt for being so happy for a felled tree - pang which I am trying to silence thinking that the birds should not suffer too much as there are plenty of trees around anyway - I am rejoycing at the opportunity to grow a bit further up the plot, now that it is lighter and airy. 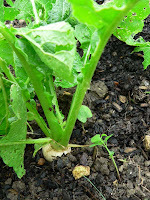 Autumn tidy-up, crop updates, what I will be planting next. This afternoon I have been to the allotment after more than 10 days. Everybody is tidying up and digging in manure. It is really nice to see everything neat and tidy after the summer wilderness. The plot to my right - which had been overgrowing for a while - is also looking much better: there are obvious signs of activity, so I guess I've got a new neighbour. I myself have sorted the polythene sheets and pallets that were lying around, pruned another little bit of the plants behind the shed (it feels much airier now!) and mowed the lawn. Also, I moved one of the waterbutts behind the greenhouse where it is shadier, and therefore less suitable for growing anything. Later on, I will have to arrange for my fig - which is planted in the sunny spot in front of the greenhouse - to grow around it somehow. Another task that I started was clearing up a spent crop bed: while doing that i was thinking that the battle against weeds is really endless and extenuating, made me wonder whether we got it all wrong and instead of working against nature we should work with it. A while ago I read "Threading Lightly" by E. Sveiby about the Australian aboriginals' way of living and learning, and I must say that their farming and fishing methods as described in the book - although sounding too good and effortless to be true - I find really appealing. Anyway, back to my allotment, I picked another handful of French beans, the last tomatoes and courgettes and some corn cobs (not sure yet they are ready, but will try them anyway). 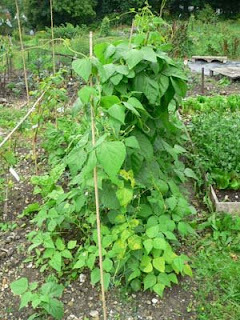 Borlotti beans and pumpkins are doing fine, and so are leeks and green manure. In a couple of weeks I will be planting broad beans for next spring. Because of the good results I had this year, I have chosen again Aquadulce Claudia (I changed supplier though). I could have done with a longer season, though, so I will be trying a spring planting type as well, which is called Express. I am still waiting for my garlic and onion sets to arrive: I have gone for garlic Albigesian Wight (I was not very pleased with last year's Lautrec Wight), and onions Shakespeare and Corrado. Plus I have some left from last year, I will try and plant those as well. This weekend - despite the very pleasant weather - I did not manage to go to the allotment. Again. However, I went there quickly on Thursday evening and everything looked allright. Spinach is coming out, corn seems fine although a bit battered, pumpkins not developing much but healthy, borlotti beans on their way. And some of the leeks are seemingly ready already! Suddenly I find myself in a very quiet period for the allotment, after six months firefighting to plant everything in time, keep weeds at bay and pick crops. It feels a bit weird, but I have plenty of other things to do that I put on hold before, so this provides a balance for my overall life! Background work goes on all the time, though. This week I have received my top-up green manure seeds (Green Chronicle has a good choice, and it is organic), I keep collecting seeds from my vegbox where possible and I have done a bit of calculations on my first year yield. Although I am surely not even, having invested a fair amount in the startup (shed, greenhouse, waterbutts, pond, mower, tools, plants and seeds), I must say that I could have done worse. 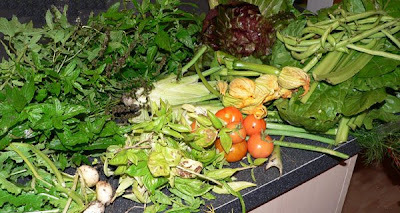 I also had an unexpected crop of spinach beet of 4.4 kg and some 2kg of courgettes, 1.7kg of shallots and 1.3 kg of French beans. With regards to soft fruit, I got 64 strawberries of 12 plants and 50 rasperries of 8 plants. 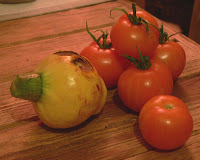 On the negative side, worst crops were brassicas (only tiny turnips survived, 7 of them) followed by tomatoes (out of the tens of seeds that germinated, only some 5 plants survived and I got a mere 15 fruits). Next year is bound to be much better with the experience I have accumulated, though. For a start I will be using more pots and plant in the ground bigger plants, which have a bigger chance to survive slugs. Then I should get some additional vegs from those plants that do not crop in the first year: asparagus, artichokes and rhubarb. And more from the raspberries and strawberries (particularly if all the runners' plantelets survive). And, now that I can figure out how plants grow and develop a bit more, I will be able to plan my sowing and planting more carefully. More about this in the next few weeks! It turns out that the corn is not gone bad: it is actually not ripe yet. I re-opened the cob leaves and the tiny pale yellow grains I noticed last time seem to be turning greyish. From that I derive there is a problem with the method of checking the tassels: it does not seem to be very reliable as the said tassels are probably very tasteful to all sorts of creatures from slugs to woodlice (I find one at the top of the cob) so they might go brown for other reasons than ripeness. I am feeling a bit better about it: I have obviously planted the corn too late... hopefully if we get warm weather this month it will still ripen. Tonight I did not have much time and the drizzle was really sad and discouraging, but I managed to quickly gather vegetables for the whole of the week. You should smell it, it is as fantastic as it looks! Now back to the kitchen to cook dinner: tonight I am on a very a tight schedule! The tomatoes were quite tasty, look forward to pick the others - this weekend I did not manage to go to the allotment: too much to do at home and miserable weather. Not a day goes by - however - that I do not at least think of the allotment: yesterday while I was out shopping I got some ericaceous compost for the blueberry bush I planted before going back to work. I am quite happy that we had some proper rain, this week: I will be on the lookout for seedlings of spinach and corn salad when I drop in after work one of these coming evenings, time and weather permitting. Too much to do, time permitting... this year I have spent most of the time "fire-fighting" as they say, trying to catch up on things I had to do. Even taking some time off work, I did not manage to do everything I planned! So I am still catching up, on pretty much everything, including reading my favourite "Magazine" (The Time's). Yesterday I was browsing last week's issue, and - unlike the usual - I read the gardening article. "Vegging out" by Alice Miles, it was. On the one hand, it was good to read that I am not the only newbie with problems labelling in a decent way. I mentioned my labels at the foot of the French beans that have been lost in the intricacy of the growth on wobbly sticks. Also, my potatoes are officially unnamed. I did label them. However, I used the labels that came on the net bag: with sun, rain and slimy creatures sliding over them, the writing got wiped out completely, so I was left with white tags! On the other hand, it was not that good to read that corn might go bad: that possibility had not really occurred to me - the plants being so beautiful and the cobs seemingly not ready. A couple of weeks ago I had unfolded the layers of skin on a cob whose tassel had gone brown, as per instructions I found somewhere. I should have tried and squeezed a grain with my nail to see if any whitish juice came out of it. But my corn is supposed to be black (Black Aztec corn, Zea Mais), and what I saw were very tiny, light yellow grains, so I folded it back. I will be feeling a bit restless now until I manage to pick a couple of cobs and try them. I was sitting half-asleep on the train tonight when my stop came: I almost jumped up and looked out, it was still relatively light. My watch said it was ten to seven so I suddenly decided I would just drop in at the allotment. With my laptop on my shoulders, the city suit and all, I almost run there. And it was fifteen great minutes before it got too dark. It rained quite a lot today in central London, so I was sure the ground would be wet, but I was disappointed: not a lot of rain seems to have reached here, certainly not the allotment. The wind (that does not make a good companion to the dry weather) has damaged the corn; on the positive side, though, it seems that the cobs are swelling a bit, which I take as a good sign. Five tomatoes have ripened and I picked them: they look really appealing and smell delicious, even though the photo (with the light of this time of the day) does them but limited justice. The yellow fruit that is with them is the pumpkin I photographed a while ago: she did not make it, so I picked her to avoid any more waste of energy by the plant. Several leaves on the runners have also wilted, which might seem a bit depressing if you do not consider that - underneath - I found the biggest pumpkin so far: some 30 cm in diameter. I had not realised it was there, it grew bottom up! Looks healthy, so the count has gone up to four. The courgette plants are producing several little flowers but no real courgette: it looks like they are wearing out. 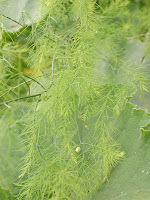 Florence fennel is also growing, for the rest, no news. But what a nice wind-down I had tonight! Crop updates, flea beetles, wildlife in the allotment. Planted cime, barbe di frate, and phacelia on the onion bed. The fennel has not recovered from transplant yet and is pretty wilted, but I am optimistic. There are three more crops now on, which I did not mention yesterday. 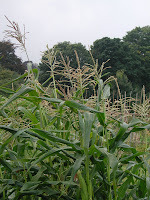 First of all, the black sweetcorn (the only organic seed for sweetcorn I could find): it is doing pretty well. Then my salad. Salad was very exciting in the beginning as it is such a quick crop and I must say it is not doing bad even now, although it has had its ups and downs. I planted lettuce, radicchio and rocket plus some mixed salad seed. A dry spell saw all the brassicas including rocket shrivelled with tiny holes. I was wondering about the mistery pest when a visit to Riverford farm provided the answer: flea beetles. These creatures apparently thrive in crumbly soil so my compost base to the bed was a bad idea. After that, a wet spell meant that most of my beautiful lettuce and a whole row of radicchio went sacrificed to the slugs, and now it is the turn of cabbage white butterfly caterpillars on the brassicas again! Finally, tomato. I planted them late and the wet spell (two weeks' raining) left the ones outside in a pitiful state as they developed white mould and then died. I have managed to pick only two (but delicious!) of tomato tomarvellous. Luckily I have a greenhouse, and the tigerella tomatoes inside seem to be doing well. Unlike the other Solanacee: chillies, peppers and aubergines have proved a little disaster. On a totally different note, yesterday I found an amazing caterpillar (Vapourer Orgyia antiqua) and a frog. Hope the frog takes residence in my pond! It is almost one year since I got my allotment, but before I can sit and reflect on progress, there are some crops that I can still plant: barbe di frate and cima di rapa quarantina so I have to hurry digging the beds before it's too late (one year and I still have not finished digging the allottment through). Besides, I have to clear the onion bed and plant green manure before it gets all weedy again. Last time looked like fish skin but without scales, white and grayish, wettish... 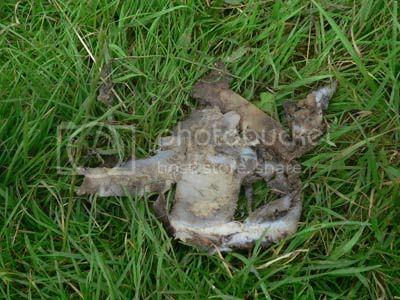 I could not disentangle it but I guess it might be some sort of snake skin - although I had never seen a so-to-speak 'fresh' one - or maybe it is leftovers from a rat's burrow; neither option is too exciting though! Anyway, today the sun has come out - albeit timidly - so I am going now to try and do all I can and to check on the Florence fennel I have transplanted. It was too thick and I never have the heart to thin out seedlings and throw the weak ones away. Crops now on: leeks (some of it just transplanted), potatoes (what is left of my summer crop), beans (flowering now), fennel and parsley, herbs (I have quite a big patch), courgettes (although the slugs are feisting on them) and pumpkin/courgette flowers (delicious and nutritious in an omelette, or deep fried in batter).